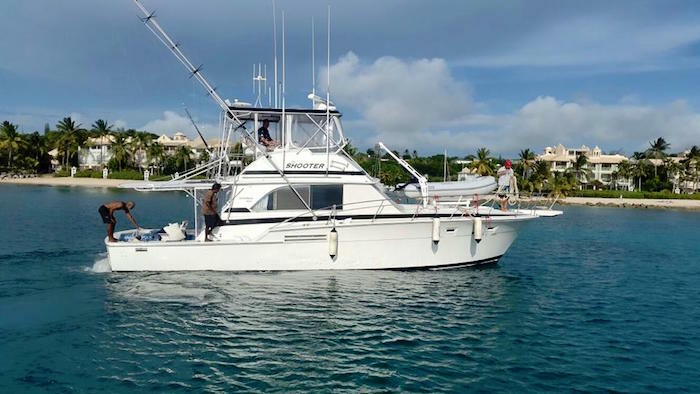 Shooter is a legendary 46ft Bertram offering luxury fishing charters in Barbados. All tackle and bait is supplied, as well as transportation to/from the boat which is achored in Bridgetown. A full bar is served, including wines, rum, scotch, gin, vodka, beer, rum punch, bottled water and soft drinks. Snacks and a caterred sandwich lunch is served with your choice of any 2 combinations of roast beef, smoked salmon. lightly curried chicken or fish, all served on a hoagie with salad. Shooter’s prices are all inclusive for up to 10 people, ranging from US$1,400 to US$2,400. This is for standard fishing charters and tailor-made charters are offered to suit your specific requirements.